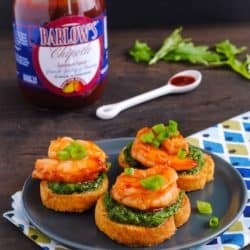 What’s the biggest “food disparity” you can think of? As in, the difference between two items that are supposed to be the same thing. The first thing that pops into my head is the difference between the taste of actual bananas and banana-flavored candy. I mean, who ever came up with the banana candy flavor and thought “Oh yeah, this tastes JUST like the real thing?” The difference is like night and day. Like Coca-Cola and Pepsi. Like young Robert De Niro (!!!) and old Robert De Niro (….). Another one is the difference between canned tuna and fresh tuna steaks. I realize that these two items come from different types of fish, but canned tuna has just always freaked me out. That smell! Even as a kid, I was incredibly anti-tuna fish sandwiches. As an adult, when my boss told me I would need to do recipe testing with canned tuna, I begged her to give me a reprieve (no, please nooooo!). She made me do it, and I thought I might die. It involved repeated dry heaving and running outside for fresh air. It was just as horrible as I remembered. That smell! Fresh ahi tuna steaks, on the other hand? 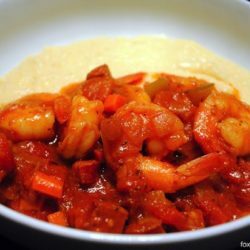 One of my most favorite foods ever, and an extremely quick yet special dinner. I buy a high-quality tuna steak, and then give it only the quickest of sears so that the inside remains mostly raw. It’s like a cross between eating a steak and eating sushi. 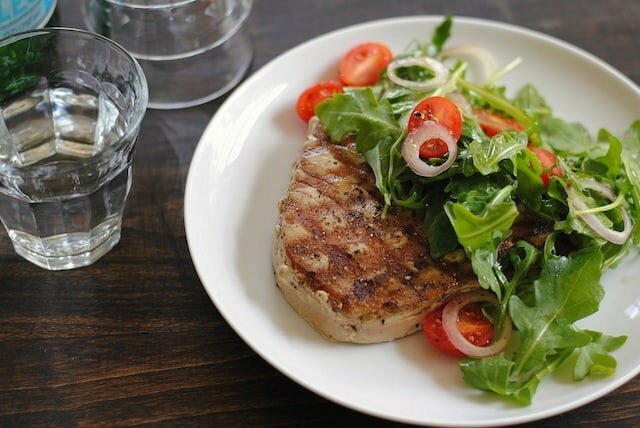 Here, I paired the grilled tuna with a simple salad lightly dressed with a fresh orange vinaigrette to round out the meal. In small bowl, whisk together orange juice, mustard, and 1/8 teaspoon each salt and pepper. 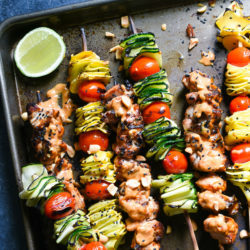 While whisking, drizzle in 2 tablespoons oil. Add shallot and tomatoes, toss to combine. Preheat grill for direct grilling over medium-high heat. 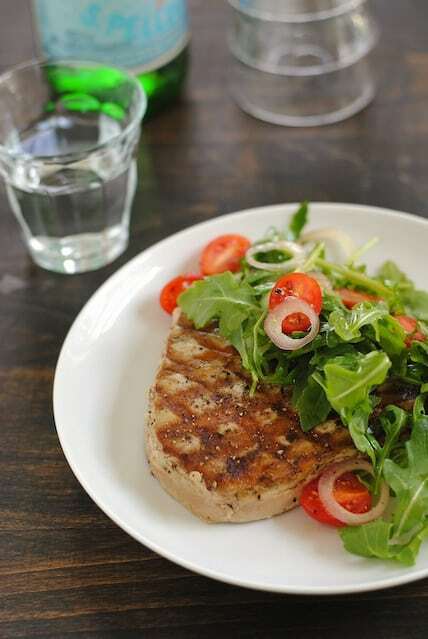 Brush tuna steaks with remaining 1 tablespoon oil, and sprinkle with remaining 1/4 teaspoon salt and 1/8 teaspoon pepper. Transfer steaks to hot grill rack. 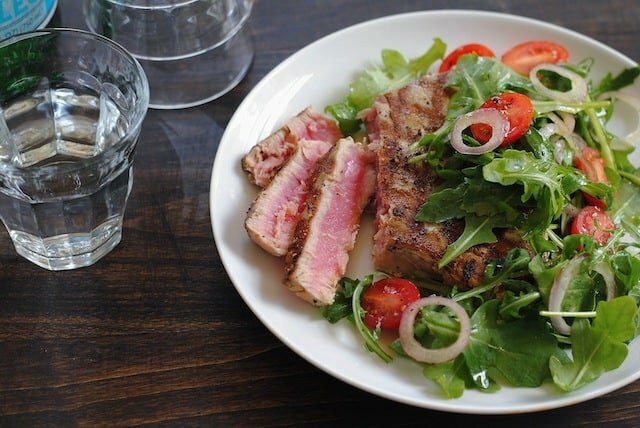 For rare tuna, cook 1 minute. Rotate steaks 90 degrees; cook 1 minute. Flip steaks; cook 1 minute. Rotate 90 degrees; cook 1 minute longer. Transfer steaks to plate and let stand 5 minutes. Add arugula to tomato mixture; toss to combine. 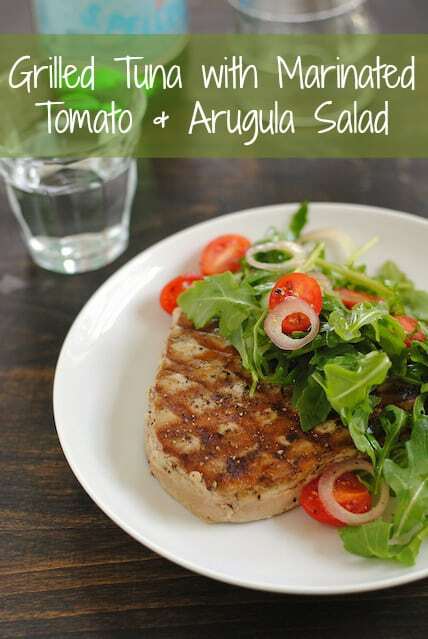 Serve tuna steaks topped with salad.